A yummy, nutritious spring salad with Mediterranean spices, mint and plenty of organic vegetables dressed in olive oil and lemon! 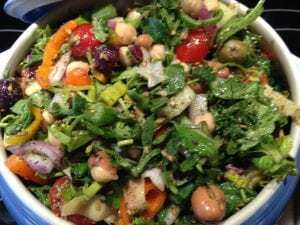 My Artichoke Bean Salad with Zaatar and Mint combines healthy vegetables with protein rich beans to make a perfect stand alone entrée salad or a great accompaniment to lamb, chicken or protein of choice. My Artichoke Bean Salad with Zaatar and Mint is just delicious, healthy for your body and a keeper recipe that you will make time and again! Enjoy!! My Artichoke Bean Salad with Zaatar and Mint is a delicious Spring salad and a bright salad addition to my blog https://simplynaturalgourmet.com . Visit our FaceBook page at:http://www.facebook.com/simplynaturalgourmet/. Enjoy on its own or as a superb accompaniment to lamb or chicken! Wonderful with a dry white wine or Pinot Noir!